Once again we're hearing that Amazon.com plans to introduce an Android tablet, and this time we have a size: it will feature a roughly 9-inch screen. It will not have a camera but will allow Amazon customers to easily watch videos, read electronic books, and listen to digital music they purchase or rent from the online retailer. The timing is reportedly before October, according to people familiar with the matter cited by The Wall Street Journal. Last month, we heard Amazon could launch tablet models in August 2011 or September 2011, with targeted global sales of 4 million units for 2011. Quanta Computer would assemble processors developed by Texas Instruments, Taiwan-based Wintek's touch panels, and ILI Technology's LCD driver ICs. 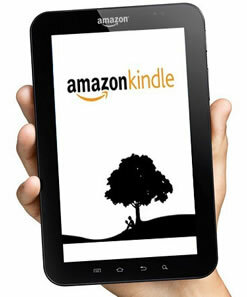 Amazon would also reportedly provide streaming movie services for users of its tablets. The rumor that Amazon is looking to build a tablet has been around for a while but it started to gain steam three months ago, when it was suggested that Samsung would build an Android tablet for the online retailer. Amazon's president and CEO Jeff Bezos has noted that a potential Amazon tablet would be more likely to supplement than to supplant the Kindle.